As one of the most avoided procedures in dentistry, root canals have always had a reputation of being very painful. While slight discomfort is common in the majority of dental procedures, a root canal doesn’t have to keep you up at night when you choose the right dentist. Here at AC Dental of Langhorne, we have successfully completed countless root canals for our patients across Langhorne, Fairless Hills, and Levittown for years. We value the importance of having a beautiful smile and have offered the Greater Philadelphia area with a wide variety of cosmetic dentistry services. Here at AC Dental of Langhorne, we practice the highest standards in dentistry and are able to take care of all your needs. 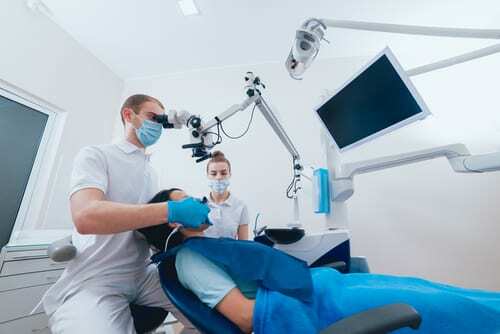 In fact, those who have been in search of a dependable family dentistry service should look no further than the experts at AC Dental of Langhorne. Why might a person need a root canal? A root canal is a procedure performed to eliminate an infection inside the dental pulp of the tooth. The dental pulp is made up a tooth’s nerves, connective tissue, and blood vessels. An infection inside the dental pulp can be extremely painful and can only be eliminated through treatment. Our dentists are able to perform root canals for those dealing with pain very quickly. A root canal starts with a small incision on the affected tooth so our dentists can remove the infected areas. Along with the dental pulp, it is common for the roots of the tooth to be removed as well. The human body only needs the roots of a tooth while the adult tooth grows in. After that, the roots are only used to feel sensations. Removing the roots of a fully-matured tooth will not lead to any direct harm. The roots are removed to prevent the small chance the infection is able to continue to grow. Following the removal of the infected area, the tooth is then cleaned to make sure the infection is removed. Antibiotics may be used to remove any lingering infection following treatment. The procedure is completed by sealing up the hole used to remove the dental pulp. Our dentists will then used a rubber-like substance to help stabilize the tooth. A filling or crown is then used to help strengthen the damaged tooth. If you didn’t know, the crowns or fillings used can now be created in a color that will match the rest of your teeth. Therefore, this makes it impossible to tell if any procedure has even taken place. Why choose AC Dental of Langhorne? Located in the Greater Philadelphia area, there are a ton of dentists to choose from. Because of this, AC Dental of Langhorne has held patient satisfaction as one of their biggest priorities. Making sure our patients are satisfied has helped us stand out as one of the top dentists in the area. Located near Fairless Hills, PA, we see a lot of families and individuals from both Langhorne and Levittown. Anyone dealing with discomfort in his or her mouth should not wait any longer. Give us a call today at 267-544-7017 to get the care you need.